One of the eternally recurring questions is: How do I Macro? This page is here to help the newbie along. If you are a seasoned veteran, you won't find much you didn't know. 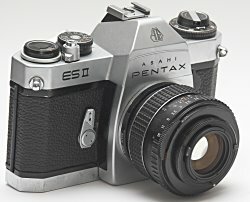 I know this has been done before, but I think I can do it better ;) This page is primarily directed as SLR users, but also includes info for digicam users. In fact, the second example image here was shot with a digicam. "Macro is photography of small things that can still be seen by the naked eye." you often want more depth of field, either for artistic reasons or "merely" to be able to show most the subject being sharp. To achieve more depth of field, you need to stop down the aperture, make it narrower. This reduces the light that reaches your sensor. Exposure time lengthens. If your bug moves or you do, the picture gets unsharp. You need a tripod and a non-moving subject. Or... You need flash. I know many ambitious amateurs are reluctant to use flash, because in front of their inner eyes, they see all those dreadful flash pics their friends shot at parties. Please read my flash info pages to see how flash works and how you can make the most of it, especially for macro use: Flash Technique. For all hand-held, non-studio macro work, I _dearly_ recommend using a Macro add-on that supports auto-aperture. You need to focus precisely, so you want the focus screen to be as bright as possible: You focus wide open. But the real exposure happens at a stopped-down aperture. If you have to manually stop down the lens (for example M42 lens on non-M42 camera), you will mess up the focusing. And as the DOF is so very shallow in Macroland, the focus will be totally off. In the studio, from a tripod, this is less of a problem, so decide for yourselves what you need/want. Dioptre lens They are like glasses/spectacles for your camera and make it short sighted. You screw them onto the front of your lens. You can stack them for increased effect. Image quality in the corners suffers very much. Achromatic Dioptre lens Instead of a single glass element, these use two glass elements coupled to form a super-spectacle for your lens. If you look closely in the picture to the left, you can see a strange line, this is the image of the second element through the first element. reversed lens in front of lens Use a reversed lens in front of your normal lens. A good combo is a bright 50mm lens (keep it wide open) on a semi-tele lens. The ratio of focal lengths is your magnification. 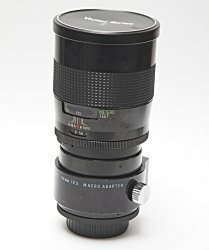 If you attach a reversed lens to a digicam, you can calculate the equivalent magnification by dividing the equivalent focal length of the integrated zoom lens by the physical focal length of the reversed lens. The reversed lens acts like a super-high-quality dioptre lens. This works well on digicams. The spider above was shot this way. 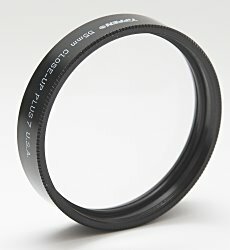 clumsy to use if you do not have a matching "retro coupling ring"
reversed lens Use a lens mounted reversely to your SLR. 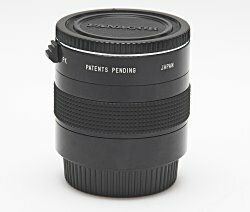 Lenses are usually designed to be best at infinity. For Macro work, the distance gets into the same order of magnitude like the lens-fil distance. It makes sense therefore to use the lens reversedly. A good lens to try this is a bright 50mm lens. Extension Tubes Insert these hollow light-tight tubes between the lens and the camera to make the camera dramatically short-sighted. It works best with lenses that are not too tele. 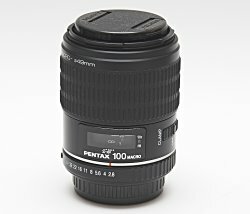 A 50mm lens at infinity needs 50mm of extensiuon to get to a 1:1 magnification. A 135mm lens needs 135mm. working distance can get very short. Tele Converter This is about SLR converters which are mounted between camera and lens. Tele converters increase magnification by their factor. 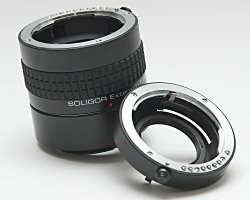 So, a 2x converter will make a 1:1 assembly from a 1:2 lens. Macro Focusing Tele Converter The MFTC is a standard 2x tele converter with a short, variable extension tube integrated. Vivitar is the best-known brand, others exist. No longer in production. works with heavy lenses, too. older Macro Lens Older Macro lenses are a good alternative if you want a dedicated Macro lens but shy away from the extra cost of a current design. Manual Focus is ok for macro use, but you need to know whether older lenses will meter with your SLR camera. If your camera uses a preflash metering system for flash, you need to know whether the lens supports it. 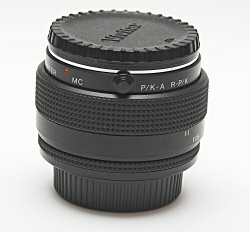 For Pentax any A and later lens does, this includes A, F, FA, DFA and DA. Older designs and coatings often have problems in harsh lighting like flash, backlighting or strong specular reflections. This shows as a hot spot, ghosting or reduced contrast. So, that's it for now. This page might expand in the future.